This is a little plugin for Ara Broker Reputations (requires r10 or above). It records and display alternative characters reputation next to the hovered faction. - Fixed alts factions to correctly save (and display) but I'm afraid you will have to log your alts again. 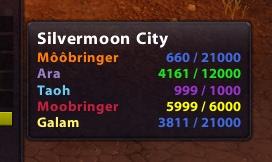 Anyone know an up to date addon like this? Can't find anything similar, was super useful back in the day. I really love this addon and its sister addon. However, there is a major flaw in this addon that I've fixed. GetNumFactions() cannot be relied on to return the correct number of factions the character has. What this functions really does is return the number of lines in your faction display. Factions under a collapsed header are not counted at all. Hence the problems I and others were having. The scanning functions was terminating before actually scanning all factions resulting in missing data. Blizzard really needs to rename this function to GetNumFactionLines() or something similar and add one that does what the current function sounds like it does. There is a way, however, to scan all reputations regardless of their expanded/collapsed state. The patched version can be found on my website here and shall remain there more or less indefinitely unless the patch become official. If I knew how to upload it here as a patch or something without creating another addon with "(fixed)" in the title I would. You will need to log into all of your characters to get the missing factions added but that should be obvious, right? @Aranarth or current addon maintainer: I'm not worried about getting credit at all. If you wish to implement my fix as an official fix, unmodified or otherwise, by all means please do! Fixed a possible nil operation. One out of my 5 character ran into it every single time the rest had no problem. Fixed counting bug. Now only counts the factions and headers that have rep. Before I was mistakingly counting them all. Last edited by credomane : 03-26-13 at 10:21 PM. Update: Somehow suddenly some of the rep begins to show up on alts, but with very different result. I have 10 characters all member of the same guild. Moused over the guildrep on all characters but alt rep only shows the rep for 3 of my characters. My death knights rep with different factions doesnt show at all. All in all, this addon seems not to be working as it should. Yes. The older r2 linked below should have been labelled b2 instead. My bad. Then its still not working. Now it records no factions at all. I have hovered over factions both in blizzards rep tap and your ara broker rep addon. This is what I get from alt.lua in your newest version after hovering over factions on 3 characters. I can mention, that the alt.lua file doesnt get created before I have logged into a second character. Aww I'm sorry, I overlooked the part with the Alliance Vanguard. A fixed version will be posted shortly. Is the r2 version the new updated version? Because the r2 version I have on my pc is downloaded july 12. I am sorry, but it still doesnt work. It only shows alt rep for Alliance Vanguard and no other factions. Last edited by martinboy : 07-12-11 at 08:33 AM. Thank you martinboy, I think I found the issue. The following version should work correctly, but you will have to log alts again before seeing anything. Last edited by Aranarth : 07-05-11 at 02:02 PM. I am using Titan Panels. Can you post your config files please ? Either put them on a host site or copy/paste the content in [code] tag. All these informations may help me reproduce your issue. It doesnt work for me either. I have version 11 of ara broker reputation and have hovered over some shared factions on a few characters, but the alt rep doesnt show at all. I have the option to remove an alt though.